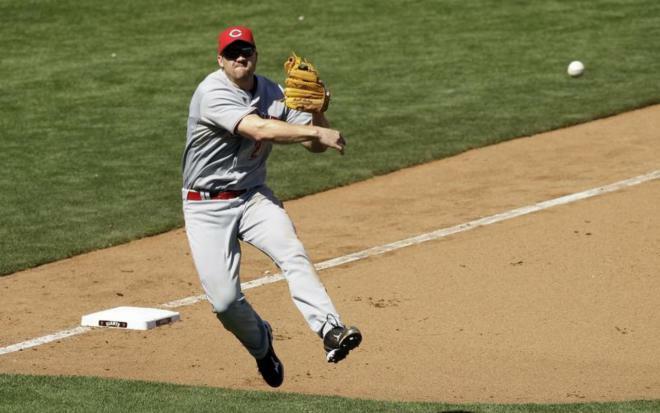 Scott Bruce Rolen (born April 4, 1975) is a former professional baseball third baseman in Major League Baseball (MLB). He played for the Philadelphia Phillies, St. Louis Cardinals, Toronto Blue Jays and Cincinnati Reds. He was an eight-time Gold Glove winner and seven-time All-Star. 2 Son, Finn Edwards, was born September 5, 2007. 3 Daughter, Raine Tyler, was born January of 2005. 5 Named to Baseball Digest magazine's 1997 Rookie All-Star Team. 6 Made major league debut on 1 August 1996. 7 Won 8 National League Gold Glove Awards at Third Base (1998, 2000-2006, 2010). 8 1997 National League Rookie of the Year. 9 Named to 2002, 2003, 2004, 2005, 2006, 2010 National League All Star Teams. 10 2006 World Series Champion. 11 Third Baseman for Philadelphia Phillies (1996-2002), St. Louis Cardinals (2002-2007), Toronto Blue Jays (2008-2009), Cincinnati Reds (2009-Present). 12 His Enis Furley Foundation is, according to its website, "an effort to brighten the lives of children and their families who struggle with an illness, hardship, or other special need." It is named after Rolen's dog, Enis Furley; its camp, Camp Emma Lou, is named after Rolen's other dog, Emma. 13 Drafted by the Philadelphia Phillies in the 2nd round of the 1993 amateur draft. On 29 July 2002, Rolen was traded with Doug Nickle and cash to the St. Louis Cardinals for Placido Polanco, Mike Timlin, and Bud Smith.